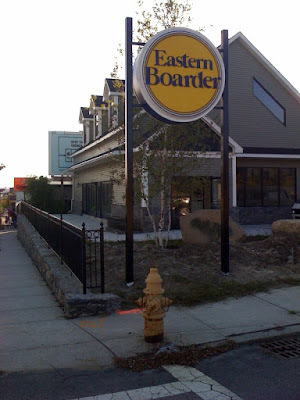 Eastern Boarder's Worcester shop has been the cornerstone of the city's Skate, Snowboard & BMX scene for almost 17 years. We first opened back in November 1992 on the corner of Richmond Ave. next to the legendary Wootown hot spot The Coffee Kingdom. After spending a few years there, the shop started to outgrow the location and in the Spring of 1996 made the move over to the much larger space at 64 West Boylston St. Now, after 13 great years on West Boylston St. we are making moves once again... this time to our brand new epic spot at 358 Shrewsbury St.
We all look forward to kicking off the next chapter in the history of Eastern Boarder Worcester. You can be sure that even though we will be in a new spot, EB Worcester will remain THE place to go in Worcester to find all the best of Skate, Bike and Snowboard products & accessories, as well as loads of the skate shoes & clothing that you need. Hope to see you all there!